Well – it’s official. My granddaughter, Miss M is officially a tween! She has reached the age where she prefers the latest electronic gadget, instead of a toy, for a gift, but those are not usually in this grandma’s budget. I was stumped when trying to figure out a gift for her, but while browsing the aisles of my local Dollar General – it came to me. 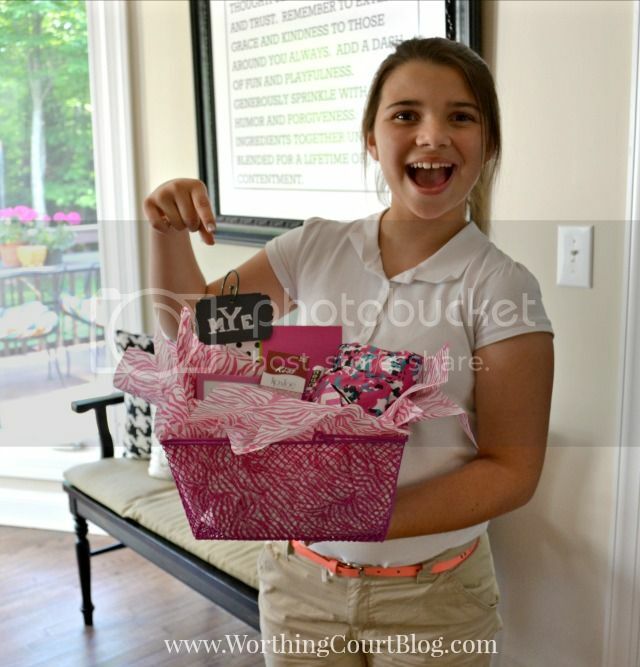 Thankfully, she’s a girly girl and I knew she would adore a basket full of girly goodies. Dollar General had oodles of things to pick from and she was thrilled with her gift! That basket was filled to the brim with everything a young lady loves. 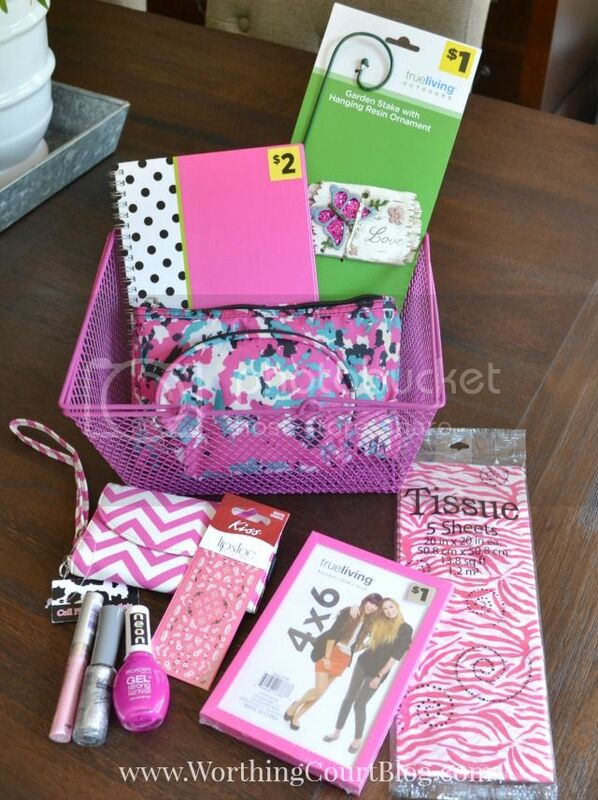 It’s hard to believe that all of this, including the basket, was only $25. I’ve found that Dollar General’s selection and prices beat out all of the other competitors for small items like this, decorative items for your house, toiletries and grocery items too. Part of what I purchased included a mini-garden stake with a cute sign. 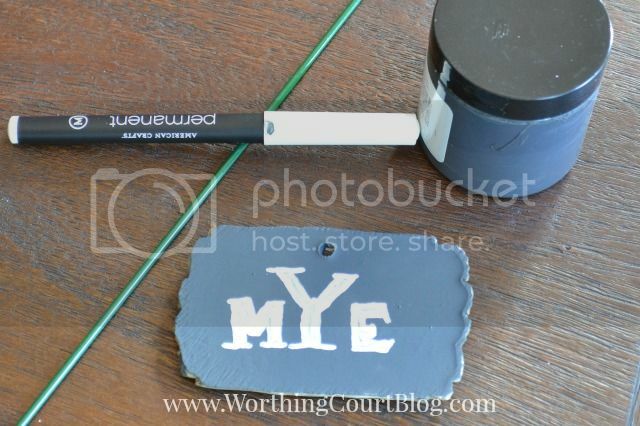 …and then added a hand-drawn monogram using a chalk marker. 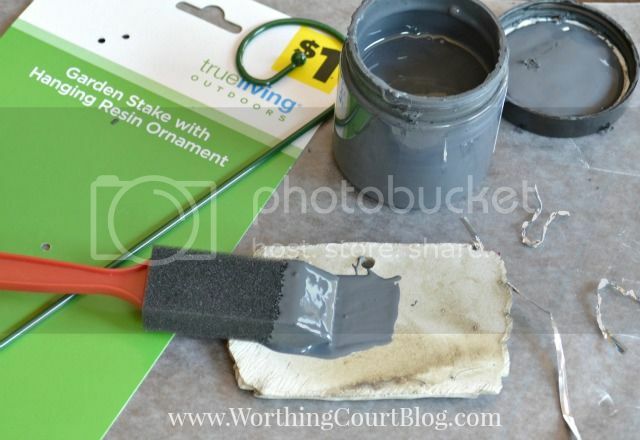 From start to finish, it only took about 30 minutes to complete the tag – most of that was drying time between coats of paint. It’s far from perfect, but I wasn’t aiming for perfect. She LOVED it and was already making plans where to use it as soon as I gave her the gift. 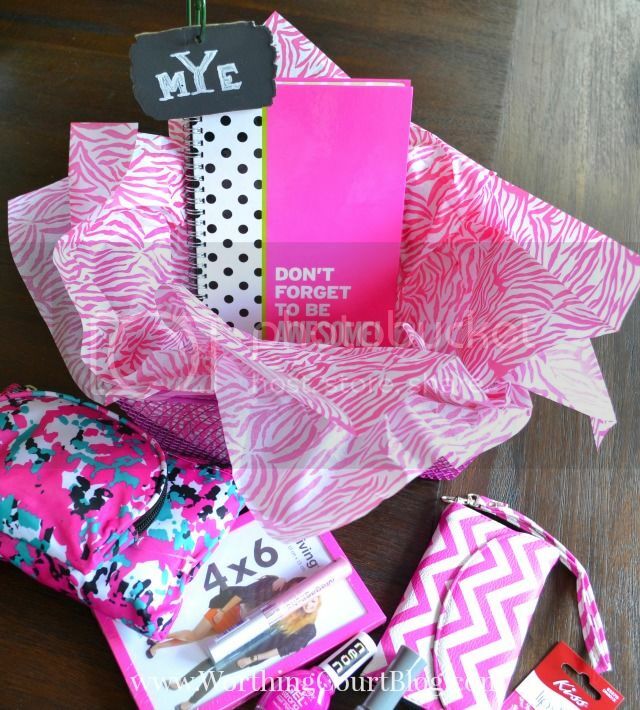 Let me give you a little tip when it comes to using those pretty patterned tissue papers in a see-through gift basket. Naturally, you’ll want to line the basket with your pretty paper, but you have to make a choice as to whether or not the unprinted side of the paper will face up or will face down. Solve that problem by placing two pieces of tissue, wrong sides together, into the bottom of the basket before you fill it. 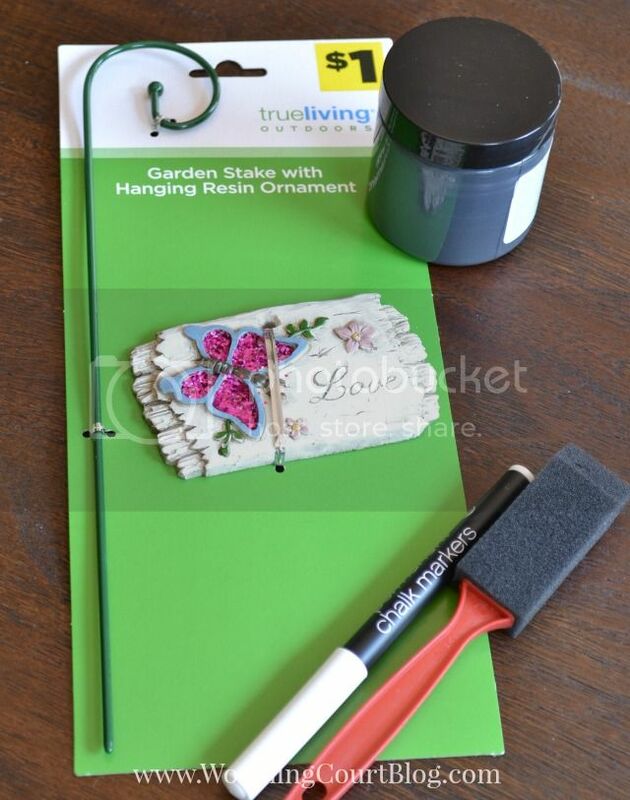 I was wondering what I would do to hold the mini-garden stake up, but it just happened to work out that it was perfect tucked into the spirals of the notebook. 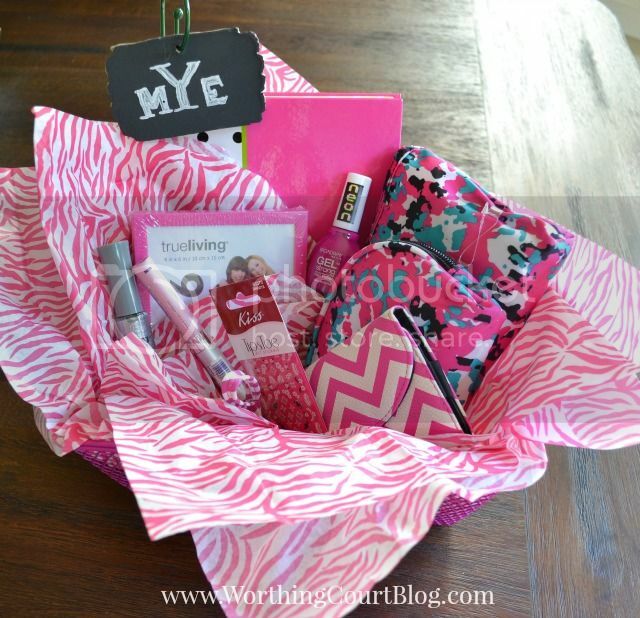 From there, I added a few more pieces of tissue and placed the rest of the items into the basket in an eye catching way. And like I said – it was a hit! Save on summer essentials with Dollar General! Check them out on Facebook, Instagram and Pinterest for inspiring ideas and more!